Provide all your agents with profiled access to manage their property listings, contacts, documents, calendars, referrals, reports and more from anywhere using their favorite internet browser. Our industry 1st cloud platform creates a highly reliable, cost-effective, online office environment. No expensive user licenses or installing software, get your agents to hit the ground running! 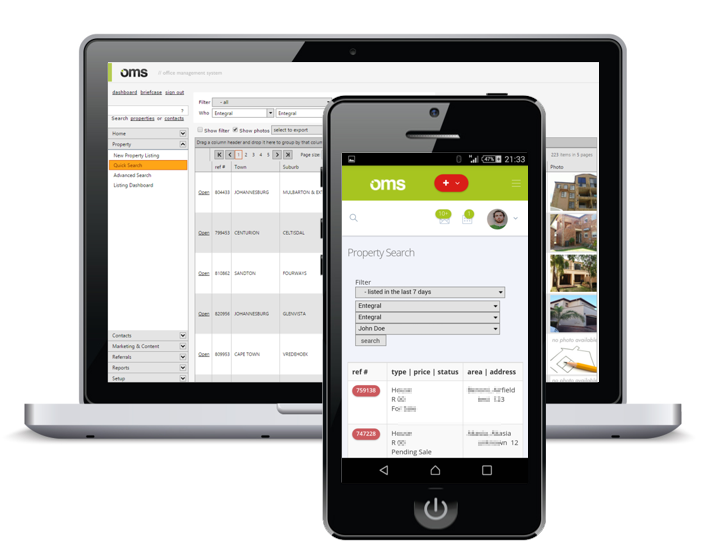 OMS Desktop provides full access to manage all your data, while our new OMS mobile provides on the go access to key data, including viewing of listings, contacts, leads and more. See which mandates are about to expire and get an overview of what is happening on listings in your office with the timeline view. An integrated listing dashboard will show the status of your listings on various portals. Never delete your for sale, rental or auction listings with our mandate history tracking. Get notified when mandates are about to expire and access your historic stock. resolution photos and virtual tours. Map your properties on a map using the geocoding feature and select whether you want the address displayed on external websites. 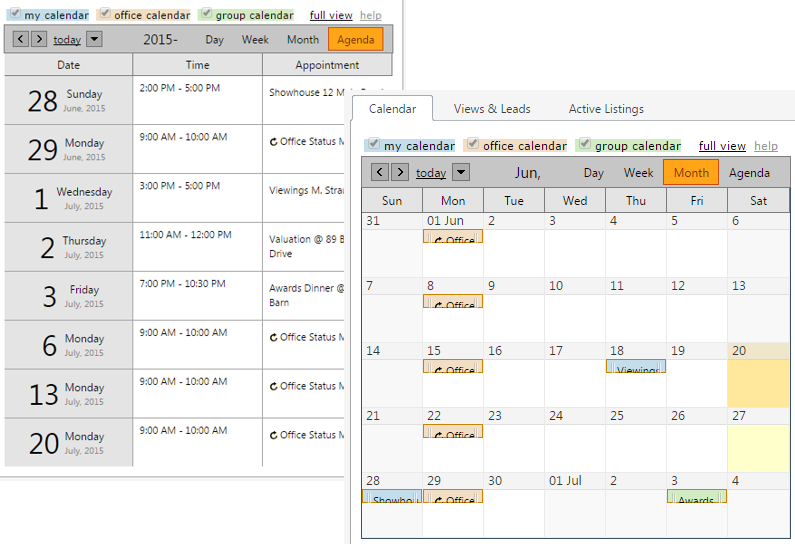 Capture on show dates on properties. They are automatically pulled through to your and external websites and removed after the show day. Instantly generate PDF property brochures with a click. Select from a range of templates or get a custom design brochure added. Generate various stock reports for the office or individual agents. Keep notes on property listings and access an audit trail that shows user actions on listings. Quickly search for listings by keyword, preselected filters (e.g. stock listed in the last week) or use the advanced search to narrow your search on active or inactive listings. Get a quick overview of the status of your listings on external portals. Problems are highlighted so you can take corrective action. Upload documents to properties, share files with clients or send documents directly to properties through our industry first fax-to-property feature. Add multiple contacts on listings and access all your contacts from a central contacts management section. No training required, use the capture wizard to upload new property listings through multiple steps. Photos are automatically resized for you and active on external websites in a flash. Our system constantly checks your listings for any potential problems advertising on websites, notifies you of problems and in many cases, our team will fix problems before you even notice them. 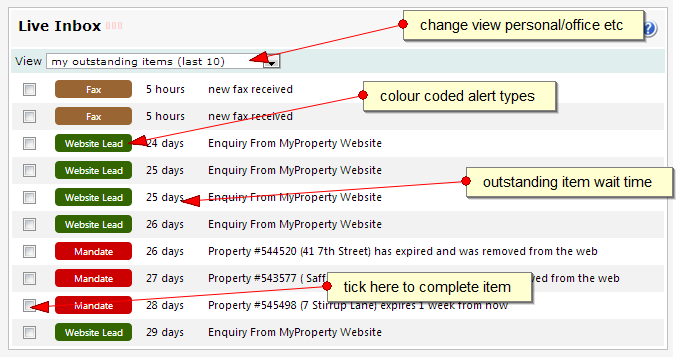 List a new property mandate, and update it instantly to leading partner property portals in as little as 2 minutes. For every listing, you can choose where you want to advertise. The status of all listings can be monitored on the a listing dashboard. The OMS also provides a direct link and reference number to the property where available. 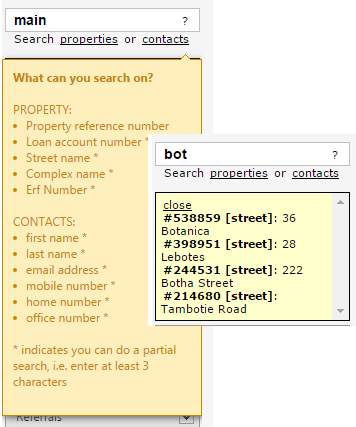 Search all your properties and contacts quickly. All your active & historic data is searched in a split second. The inbox shows you leads received, mandate warnings such as listings about to expire, incoming faxed and other notifications in real time. 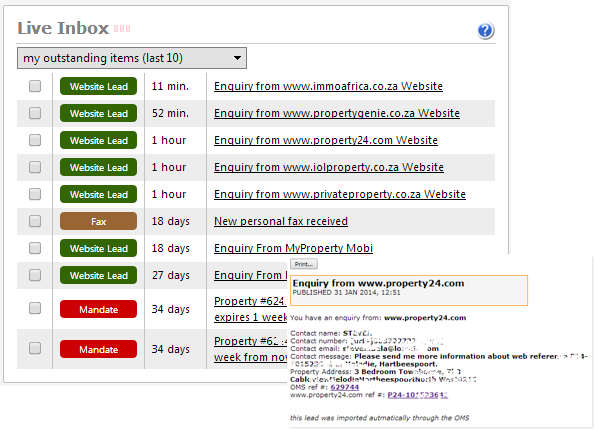 While leads from your own website and MyProperty is automatically imported into the OMS inbox, you can also import leads from external portals like Property24, Private Property, IOL Property and ImmoAfrica and consolidate your leads in the OMS. A central document library allows you to share files with your office or group, while a personal document library allows you to save personal files securely in the cloud. Upload files to property listings and optionally share them on your website or send as a download link to contacts. Keep all your contacts in one place and optionally share them with the office. Create your own contact categories and send & track referrals between offices. Keep notes on contacts and see which listings are linked to them. One of the ways you can improve ranking of your website is to post regular, unique content. 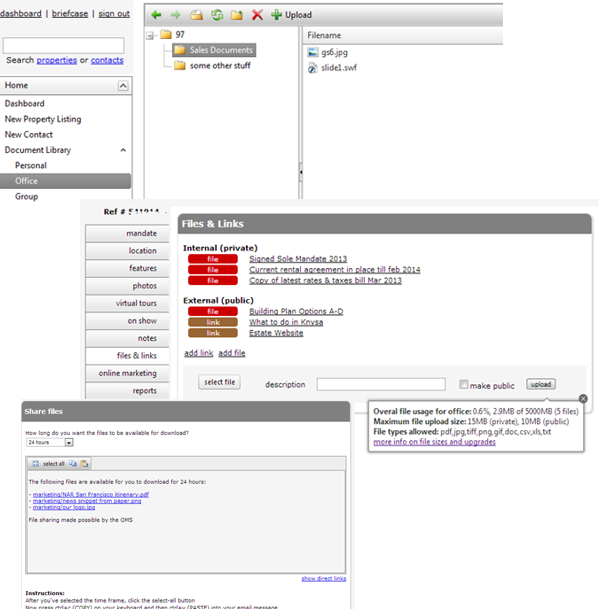 The OMS provides a content management system that allows you to publish news items for your website or your staff. Send buyer, seller or rental referrals between offices in a group. Track the status of each referral, send messages and action referral through a simple workflow process. In addition to the individual property brochures that can be generated at the click of a button, the OMS provides various stock reports that can be generated for individual agents or the whole office. Stock reports can also be generated from the system’s advance search functionality, giving you more custom filtering options. The OMS also features performance reports, which gives a breakdown of stock based on statuses, areas and agents. The reports are based on Lightstone data and is conveniently available through the OMS. User can draw PDF branded reports while each office can configure which agents can draw reports, and how many per month. 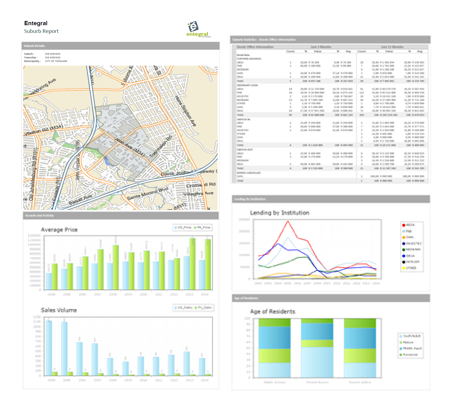 The Property Intelligence Reports is optional and are available at additional monthly fees. Various aspects of the system can be configured, including your office details, agent profiles and their access levels, photos and logos used on websites & brochures. Everything you capture including property photos are backed up securely around the clock on our cloud infrastructure. The OMS API is an open interface that allows access to your office data to 3rd party apps and developers. You control who has access to your data through access tokens granted through the OMS. Various access levels can be granted. Only active property listing data (that is available on websites) can for instance be made available for import in a separate app. There is no cost but you are limited to the number of external integrations based on your OMS package.